Late on a Friday afternoon Foxford Woollen Mills, the Mayo-based luxury and contemporary homewares store, might seem a strange place to find a teenage girl doing her homework. But there she was sitting comfortably at a corner table, nursing a pot of tea in the restaurant area of the mills. 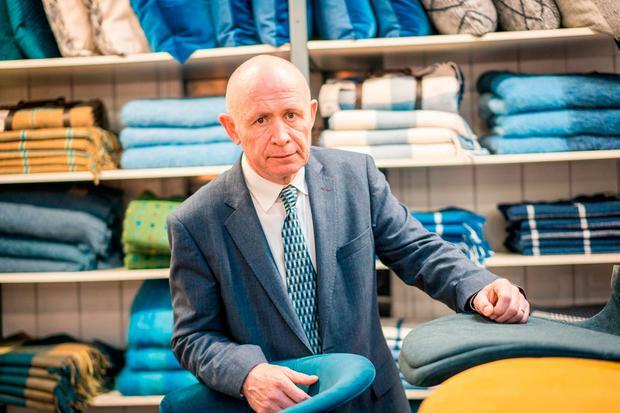 The relaxed pace of the cafe is in stark contrast to the demeanour of Joe Queenan, managing director and majority owner of the business where blankets, rugs and throws are still manufactured and sold as they have been since 1892. Queenan, who bought into the business in the dark days of the 1980s, is a ball of energy, clearly energised by his ambitious plans for the company. Foxford has just embarked on a new digital journey and it is embracing the online market with plans to double turnover at the business in the next five years through a multi-million euro investment. "Online is in its infancy with us, we only started about 18 months ago," he says. "We have plans to double the turnover at the company in the next five years from €7m currently to €14m, and most of that growth is going to come from online. "With online you're pushing an open door but it takes money. We will lose money in the first two to three years - whatever turnover you do, you'd be losing 10pc, and once you get up to €1m you're at break even," he adds. Queenan, from nearby Lahardane under the shadow of Nephin Mountain, is a numbers man, a qualified accountant, but he admits Foxford Woollen Mills was late to the internet table. "We should have been at this 10 to 12 years ago," he says. "We were too busy doing other things at the time, mainly building up the manufacturing and brands end of the business, and we took our eye off the ball regarding the internet - to our shame really," Queenan says. "There was a survey done recently that showed that 27pc of Irish SMEs have no internet platform and when you think of all the money that's leaving the county and the country - a lot of retailers are complaining, and rightly so, that retail is decimated but they really need to get online." There has been a sea-change in the market since Queenan first invested. "Retail has changed and that's the truth of it, it's disrupted many industries. Every product now, with the odd exception, is a commodity and you don't have to go into a shop to buy stuff - just like you can buy flights online, you can buy your bed linen, throws online, we also sell furniture online," he says. Queenan adds that online will become Foxford's largest outlet, outshining the Foxford store eventually. He expects that 60pc of online sales will come from Ireland, 20pc from the UK and a further 20pc from the US and other markets. Because many of the products available are high-end, Asia would also be an ideal market but the company is strongly focused on its current online growth map, at least for the near future. "There's enough low-hanging fruit that we're not even picking yet in the Irish, UK and US markets and that will provide a platform to then maybe looking at the Chinese market. We're so far behind the web market that it will be three years time before we look at anything else." The core of the business remains design and innovation, says Queenan, and that will always be the case no matter what new direction it takes. After all, it's in its genes. Foxford Woollen Mills was founded in 1892 by Sister of Charity Mother Agnes Morrogh Bernard through the combination of borrowed money and some business advice from an unusual bedfellow, a Protestant Freemason. The River Moy was a natural attraction for the location as it powered the mill, and as the reputation of the quality of the products, mainly rugs and blankets at the time, grew, the business and management skills of the nuns attracted the attention of the Congested District Board. It gave the mill a grant to build up the business as well as train up local weavers, and soon the enterprise was profitable. But while Foxford's reputation for quality never died, the business diminished over time as consumers gained an appetite for cheaper alternatives. The receivership in 1987 was a body-blow for Foxford, as it would be for any small town. But Queenan, who worked for the receiver at the time, believed the business had a future. "Part of it was naivety at the time, and I loved the history of the place. I was determined too but times were tough," he says. "I bought the business out of receivership. At the time inflation was 18pc, unemployment 18pc and the marginal rate of tax was 60pc and to me that time was much worse than the worst of the recession in 2008. "In the 1980s it was a black time. With the most recent recession we could remember the good times and we knew they could come back. But back in the 1980s we were controlled by the church, the pope - it wasn't a nice place even from a societal perspective. "But I have to say it was a Business Expansion Scheme (BES) that got us out of the woods," he says. His business partner from the early days, Wexford businessman Tom O'Mahoney, is still a shareholder in the Mills and while there was a share buyback in 2006 there's still a little bit of BES money involved. "Without the BES we would not have survived. It was a BES in the truest sense, there was no such thing as venture capital in Ireland at the time," he says. As they grew the business, they never took their eye off the design ball, and that has stood, he says. They enlisted the help of designer Helen McAlindan, who introduced new colours, textures and patterns, and she still works with the design team at Foxford. The company now employs 80 people - from loom operators to the staff at the cafe. There are 11 looms in operation and 40pc of sales are manufactured there. "Our ethos always has and will continue to be design and innovation driven because there's no point in trying to compete with the commodity markets of India and China. They'd bury you. We believe in giving good quality, good design at affordable prices - that's our USP, I suppose, and that's partly why we have survived two recessions," Queenan added. The last recession, he says, was different to the first. "The fact that we were an Irish brand played a part in surviving the last recession, people stuck with us and they started supporting us as the "irrational exuberance" they talked about went out the window. There was an element of the green jersey - supporting Irish jobs. And Enterprise Ireland was also very supportive," he says. Speaking of harder times, he is as concerned as anyone else about the implications of Brexit. "I haven't a clue, to be honest. And I think most people are not prepared for it. "We are trying to prepare - we are talking to our suppliers in Europe. We had spinners in from Italy recently and we asked them what would happen if the UK land bridge closed. They looked at me as if I had two heads. I still think it will be fudged and will be kicked down the road. We don't have a lot of business with Britain, but what would affect us would be if there was a general shock to the economy and that would affect everybody, the local pub - it would go right through the system if we go into recession. And interest rates are on the way up, that's a foregone conclusion." But on the whole, Queenan has little time for dwelling on negatives, and he is upbeat about other innovations at the Mills. It has recently opened at Kildare Village and products are available in Brown Thomas, Arnotts and a range of outlets and stores around the country. A new music and drama venue has recently opened at the Mills and a tour involves a self-guiding history of the building in a number of European languages. Visitors to the centre learn the story of Mother Agnes (1842-1932) and are taken through the Mills as it runs today, where they can watch craftspeople at work. As he finishes up his interview, it's hard to imagine that Queenan hasn't a few more tricks up his sleeve when it comes to innovations at Foxford Woollen Mills. Maybe there's something creative in the Moy water or maybe he's just someone who clearly loves what he has helped to restore and grow.